The most common wet basements are the simple result of water leaking in through the joint where the floor and wall meet. This can occur when a large amount of snow melts, during a consistant number of rainy days, or even after one heavy downpour, depending on ground saturation levels. 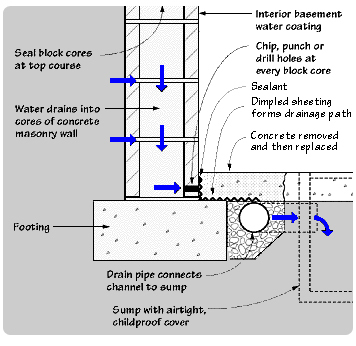 Surface water collects and builds up in a pocket around the foundation causing hydrostatic pressure. This pressure then forces water through the wall and floor joint and causes 90% of wet basements; most easily and effectively solved using the interior drainage system. The most effective of the interior drainage systems is a perforated drain pipe (drain tile) installed inside the perimeter of the footing. This requires removing and replacing concrete at the slab edge. By placing the drain pipe beneath the slab, it drains the area to a lower level. The drainage pipe then connects to a sump pump which is installed with an airtight, childproof cover. A critical component of this system is the dimpled plastic sheeting placed at the base of the wall and beneath the slab edge. Dimpled sheeting is similar to a small egg crate and permits free drainage of the wall into the drain pipe. It is less expensive than many specialized drainage channel systems. Even in low permeability soils, this system can accept rising groundwater due to the installation of an aggregate layer poured under the slab.